To prevent iron poisoning or at least an overload of iron on my blood test in two days (can you imagine what the lab technician would think if I registered near Superman iron levels?…hahaha), we brushed the kawa several times and cleaned it out with water. Then we added water to the pan and boiled it. 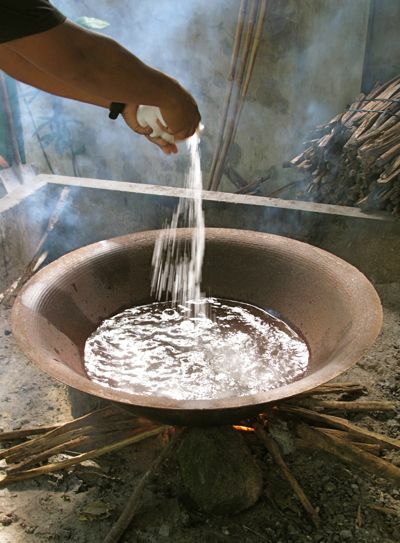 Once the chicharon demonstration began in earnest, the pan was filled with several gallons of water and a lot of natural sea salt. We hired a brother-in-law of one of the crew to teach us the “Carcar” style of making chicharon and he was well aware that we were thinking of adding the product to the Zubuchon offerings if we managed to eventually cook a chicharon we could be proud of. Our lechon “consultant”, G, was a wonderful and patient teacher, doing a couple of batches with us so we could watch the process in detail. It may seem/sound deceptively easy, but trust me, the simple processes are the hardest to perfect. 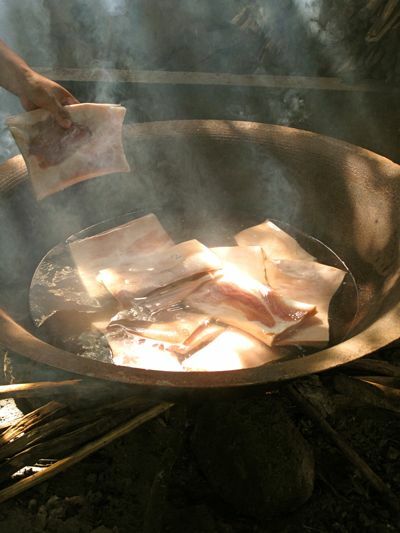 Once the salty water was hot, but not on a rolling boil, we put over ten kilos of pork skin with fat into the kawa. This was stirred with a large bamboo stick to keep it moving. Thanks for sharing the cooking process, MM. looking forward to trying the Zubuchon chicharon in the near future. Looking great, MM! My cholesterol level went up just looking at that photo. I do realize that you are going for traditional Carcar chicharon, but you should try adding some bay leaves and rosemary sprigs in the water before boiling. Hi MM. Happy new year. The chicharon looks delicious. But your pictures are getting better and better. Excellent lighting on the images on this post. Ako rin nabitin, at naglaway!!! Looking forward to the next post, MM. I think a large bilao might do a better job as a tray and strainer as well. APM, you are pre-empting me… :) Stay tuned. the first photo looks really good and yummy! Cholesterol…bring it on! Will definitely try this cooking chicharon the week after the chicharon chronicles are complete. Thanks MM. BTW, Had the fortune of eating Zubuchon for the third time in Cebu. It tasted as good as I remembered it! I can see that your “kawa”is still kinda rusty despite the repeated washings.Is it really safe to use? I’m asking because I have an old rusty “kawa”too and am tempted to rejuvenate it using rock salt,”isis”and a lot of elbow grease. Can I use coarse sandpaper? Tnx. Giancarlo, glad to hear it didn’t disappoint! Thanks for coming back for more! 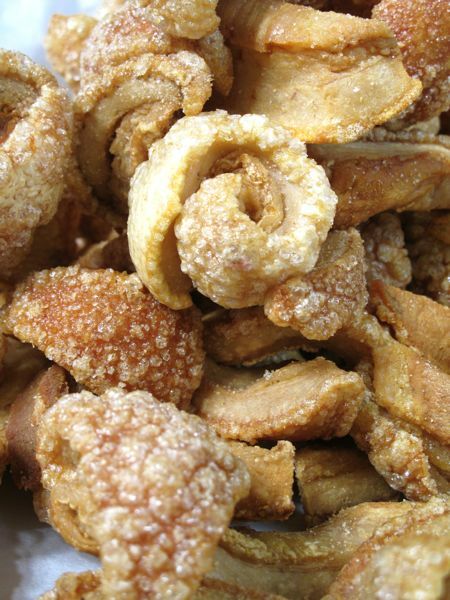 this is what i look forward to when i go to philippines…chicharon from guagua! I simply cannot wait to go home and try your Zubuchon lechon and these chicharon! They look sooo good! Off topic, but have any of you guys seen this? “heaven can wait”, indeed! hmmm…time for a chicharon eyeball! some seasoned vinegar and i’m good to go… MM… this isn’t healthy craving at 12:51AM! this actually reminds me of the time when i bought 5 kilos of pork fat to render lard from. UGH! Looking forward to the next post already!!! Thelma…I learned how to make chicharon from one of my sister’s BFF’s mom (may she rest in peace!) back in the 70’s. I am trying to recall if they spoke Capampamgan but I think they did. Anyway back to chicharon. She used to tell me that it is fool-proof for this is probably how they did it in Pampangga. This is probably what you buy inGuagua. We made this chicharon for about 5 to 6 years and also have taught several close friends how to do it. So if oyu miss the Guagua chicharon though I am not sure if the Carcar style and Guagua are similar for what we did was akin to the Carcar style…then please give the one I posted a shot. I have taken the guesswork out of it…no offense, MM! Because of your chicharon post, I am now in the process of making it…will fry it before Tuesday ( I have to before hubby comes home) and already have checked my blood pressure yesterday and will go have those blood tests Doc told me to get on Wed.
For dips..has anyone tried vinegar with minced garlic and the siling labuyo brine added and a bit of sauteed alamang? For seasoning Thelma, we seasoned the chicharon right after we took it out of the mantika. My siblings prefer the chicharon made out of the pork skin from the pigue, not too fatty and it really puffs up like the ones you buy. I don’t know if you have made chicharon before, Thelma, but if you do try it and have to use the oven to dry it, I usually take it out of the oven when the skin is really, really dry and the fat is opaque. The skin turns from creamy white to neutral color or like beige-y or eggshell (paint color). Then once in the casserola and being rendered of the fat, it turns brownish like deep tan. The heat should be just barely simmering and not boiling when rendering the fat. But once you are ready to fry, then heat it up on high. The fatty-less ones, takes only a few seconds to fry. We usually fry those ones first. 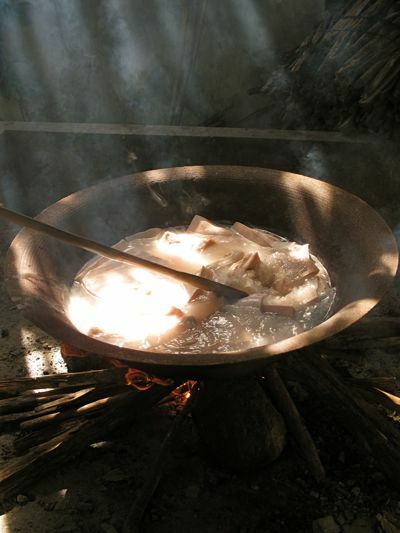 When I was young we are able to make chicharon at home using the turbo broiler as the drying agent. It was pretty good for homemade. Cannot wait for next posting!! the chicharon are mouth watering.My niece & my sister in Pampanga , who have catering business ,accumulate a lot of porkskins,after a “toonage” of it They will turn it to chicharon and will share to everyone,client & neighbors!It is very similar, but they uses oil instead of water,when putting the uncut freshpork skin ,,the skin will be soft to cut.when i went home last time,i learned how to make chicharon.Cannot wait till next posting.coz your site is my holy grail:) when learning how to do a lot of technique in cooking.Yummm. That kawa is BEAUTIFUL! Is it still being sold anywhere? I want one! As for the chicharon, are you going to do a separate post on how you managed to source or prepare the lard? I’m so curious to know! Happy 2011 to you, MM! Your chicharon is exactly the kind i like to buy and eat with ice cold coke and dip in sukang iloko with minced garlic, siling labuyo and bagoong isda. This is also the kind i top my pancit palabok with, slightly grounded so the crunch is still there. Zubuchon and now chicharon? Hay i wish i was in Cebu. Peach – there are a lot of anitque shops in Plaridel, Bulacan. Coming from Manila,take the Sta. Rita Exit at the North Luzon Expressway turn right going to Baliuag and in a couple of meters, you will see several of these shops along the highway. I was able to buy several “tacho” or the copper (?) pans Grandmothers use to cook sweets in. They were in good condition and just needed cleaning. I have also seen kawas for sale there. Car car chicharron is the best! Coming home for the first time in four years, my first request was to go to Cebu and buy me some Car car chicharron and Zubuchon! We had a wonderfully piggy Noche Buena! I took heaps of photos of my cute Zubuchon box and lugged it all the way back to Shanghai to remind me of fun times at home. Maricel, thanks a lot! Now I am REALLY excited. Not because of the kawa anymore, but because of the COPPER PANS!!! Thanks thanks! Marketman, please do not wipe out the stocks in Bulacan!!!! By the way, didn’t know that pork rinds have to be boiled before deep frying. Is this a technique unique to the “Carcar” style? Ok that’s a bit of relief! Hope you stay put in Manila or Cebu for the next couple of weeks! Time to sweet talk my husband into driving me all the way to Plaridel, Bulacan for some pots :-S Doesn’t sound too promising. Hahaha. Oohlala! I am waiting with bated breath! A very dear friend I have come to know through your blog though we haven’t met in person buys her pots and pans in Plaridel antique shops since that is where she resides and only commutes using the public transit. She has told me about those antique shops about 2 years ago and has offered to buy a tsokolatera for me. She heard through your blog I think that I was looking for one a while ago. She bought one for herself though it took her quite sometime to save up to buy one. What I am afraid now is that the shop owners might raise the value of their inventory now that people will flock there and will not make some items if not all affordable to the locals like my very dear friend. I sincerely hope that I am wrong and that their prices will remain the same. MM and Peach, just drove by the shops and spotted a huge kawa, a little rusty but after seeing MM’s kawa that had just been used for 4 hours then I guess it would be ok. There are several small shops on both sides of the highway and a big one further down to the left. oh, i’ve been lookin for a tacho. my mom says fuit preserves are best cooked in a tacho. want to fly to bulacan right now! 2 days ago, my brother and I fried kilos of bagnet, and after devouring half of it for crunch test, I did not want to eat more for fear that i would be an emergency case…….. and now this post is killing me! I can’t wait till morning to buy me a chicharon laman— yummm yummm! Its always a delight to learn of various cooking vessels, such as your kawa. They say the kitchen in heart of a home. Certainly the passing of the kawa from one generation to the next is an extension of that love. Instead of Fe poisoning, I’m thinking perhaps you won’t have anemia to worry about as a health issue! For the residual rust, maybe sandblasting done by an artistic hand could be of help. my norwegian husband is still talking about it, the best lechon he have tasted, he said. Now there’s chicharon. Samot na jud he will be more excited next time we visit cebu. Hope you use my pasalubong, brown cheese from norway. Norwegian usually use brown cheese in their sauce for beef, reindeer or moose. Enjoy, MM. thanks, betty. 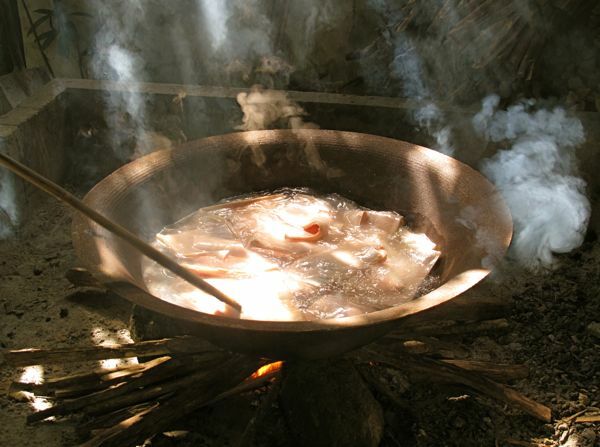 i will try to cook the chicharon this weekend the way that you make yours. mm’s fried bananaque with vanilla ice cream. Thelam, I am making a second batch, drying in the oven right now…will take it out maybe tom. morning and render the fat. I forgot to tell you, we made the chicharon at the store for 5 years from late-70’s to early 80’s. 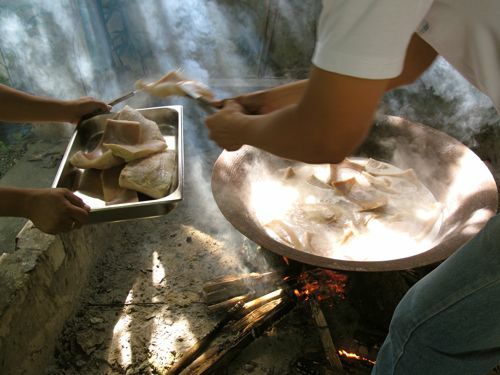 But in total, this is how we made chicharon for the last 30 years now. It has never failed me yet. 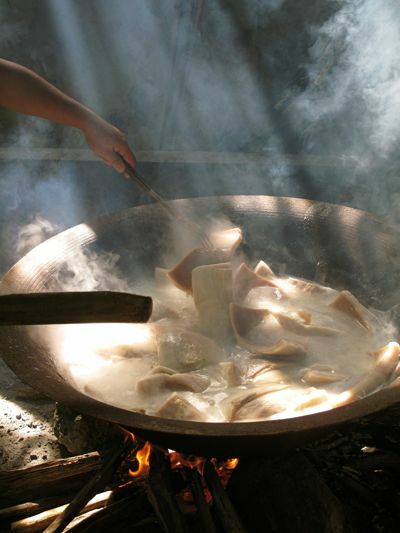 I prefer to fry it right after rendering the fat…the pork skin is deep tan in color and some blisters start forming along the edges and the skin is still quite soft and pliable…straight inot the hot fat to deep fry them and they turn out really puffy! hello market manila…..been busy lately and guilty of not visiting your site. the zubuchon sisig IS heaven.i just reheated it in a cast iron pan to get a crunchy crust. the following day my daughter reheated the leftover sisig and it became chicharon.that is brilliant – sisig chicharon! thanks for making it available in the airport! 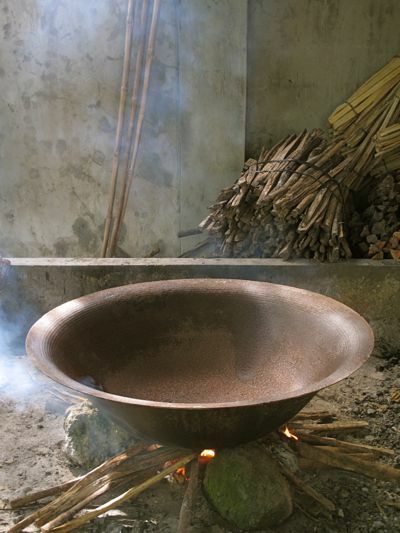 Maybe you could prevent the kawa from rusting by seasoning it like a cast iron pan. Don’t use detergents to clean it, just water and a brush. Wipe it dry and coat it with grease before you store it. It’s beautiful and I hope your family gets to use it for generations.